English Longhorn (also known as Longhorn, Dishley, Lancashire, Leicestershire, and Warwickshire ) cattle are raised for meat, milk and used to be employed as a draught animal. 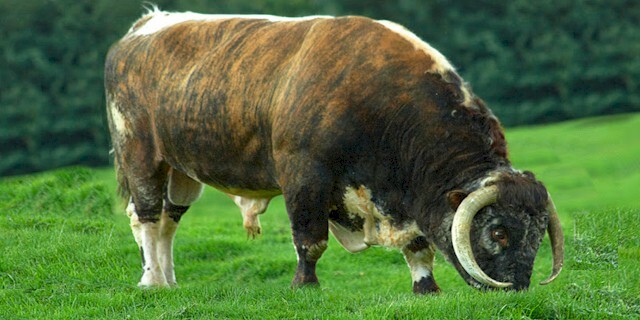 As the name suggests, the breed has long horn and originated from Craven, in the north of England. They were first breed and later improved by Robert Bakewell of Leicestershire, England in the mid-1700s. Bakewell pioneered the use of inbreeding technique in cattle selection. And he selected the English Longhorn cattle breed for quick growth and heavy hindquarters of these animals. Selection efforts of Bakewell led the breed to become the most widely used animals throughout England and Ireland until it was surpasses by the Shorthorn cattle in the early 1800s. Their total population declined rapidly for nearly 200 years until the breed was rescued by the RBST (Rare Breeds Survival Trust). And the efforts of RBST resulted in 255 registered animals in 1980. Currently the English Longhorn cattle are available in United Kingdom, Germany, Ireland and New Zealand. English Longhorn cattle are medium sized and both bulls and cows have long horns. They are mainly red, brown, grey, or white. Their horns are very long and curved down to around the nose. There are white patch along the line of their spine and under their bellies.